Whether you live in Davidson County or in the surrounding areas, there are plenty of Easter Egg Hunts planned this season. This list will grow as the holiday gets closer so keep checking for more Easter fun! 16th annual Southeast Egg Hunt & Festival being held on the S.E. Park in front of the S.E. Library and Community Center, 5252 Hickory Hollow Parkway, Antioch, TN from 10am to 2:00 pm. Free for all child up to 10 years of age. Nashville Zoo’s annual spring celebration is back with egg hunts and Easter treats for children of all ages. Activities during the day include 10 scheduled egg hunts for kids, a Zoo-wide hunt for golden eggs, spring-themed games, bounce houses and face painting. Special appearances by the Easter Bunny and Zoo mascot Twiga! Free with regular zoo admission or membership. Find tips on parking, traffic and more at this link. Join The Hermitage on Saturday, April 20 at 3:30 p.m. for a very special egg hunt on the beautiful lawn of Tulip Grove Mansion. This will be our last program of the day and is open to all individuals on the autism spectrum and to anyone with developmental or physical needs, as well as their families. The program will feature the same range of activities as our morning and afternoon programs, geared toward children with all ranges of needs. In addition to the egg hunt, families can also decorate and race in a traditional egg roll, have a special photo with The Easter Bunny, decorate cookies, create cards for military troops, participate in craft activities and lawn games, and enjoy story time with Usborne Books! Tickets are available online and cash only at the gate. $12 participating kids and $6.00 adults. Infants and Member adults receive free admission. Event admission does not include general admission to The Hermitage. Face painting and food trucks will also be on-site for additional purchase. Hop on into Bass Pro Shops – Nashville and celebrate Easter with us! The egg hunt will take place on Saturday, April 20. Register at 1:30 PM. Hunt starts at 2. See this link for more details. 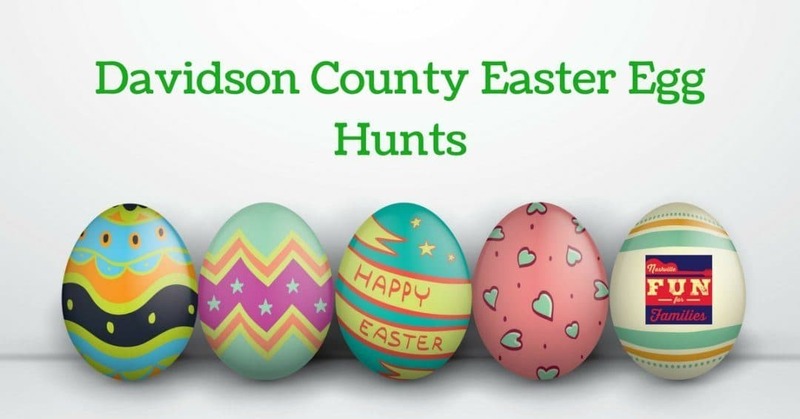 There are also Egg Hunts in Rutherford County, Robertson County, and Wilson County. Eat breakfast with the Bunny and get your picture taken too! Get more ideas of things to do from our Ultimate List of Spring fun and find even more Easter fun in our complete Spring and Easter Guide just for Nashville!